The momentum that the ruling Justice and Development Party (AK Party) has built since 2002 did not wane on Sunday, as the People's Alliance with the Nationalist Movement Party (MHP) declared victory in the local polls, taking 51.9 percent of the overall votes. 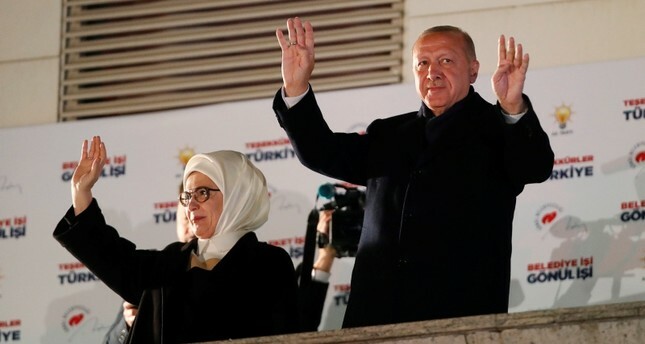 "The results show that we again turned out to be the leading party with major outpointing," President Recep Tayyip Erdoğan said after the election results were revealed. "Preliminary results show that AK Party is the first party with a clear lead, and the People's Alliance we formed with MHP has won some 52 percent of the votes," Erdoğan added. "We have won 778 municipalities in total, including 16 metropolitan municipalities, which means 56 percent of all municipalities in Turkey will be governed by the AK Party," Erdoğan said later Sunday night. He said together with the People's Alliance, they won 24 races for province centers, 538 district races and 200 township races. Expressing his gratitude to the People's Alliance and his partner MHP leader Devlet Bahçeli, Erdoğan said that they will "continue to work for our country to make it a peaceful place." Turkey held its first local elections under the new presidential system, adopted in the April 2017 referendum. The previous local elections were held in 2014.